Last day to save with printable coupon from Aéropostale! 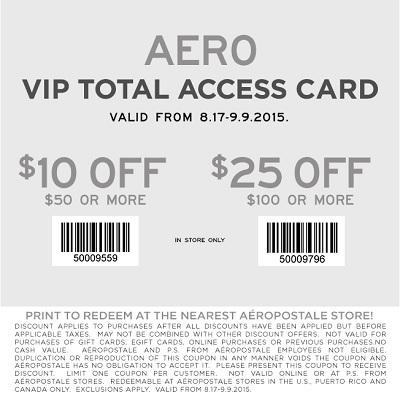 Print the coupon, bring it to your nearest Aéropostale store and enjoy shopping. Spend $50 or more and take $10 off. Or, spend $100 or more and take $25 off your purchase. Source of the information is Aéropostale. Hurry up, ends today (09/09/2015). More information available at stores.